You have strong medical experience, a great education, and skills to help you succeed, yet you’re struggling to land a job interview. What’s going wrong? In the tough job market, you need to make yourself stand out from the crowd. Your resume should be eye-catching and informative enough to make a hiring manager want to learn more about you. Building this type of standout document does not happen overnight. In fact, it takes a lot of practice and know-how. You could read through tons of tips to help you make a successful resume. Or if you want to see a little success right now, you could browse through our medical resume templates and writing guide. Why Use Medical Resume Templates? These templates give you the format and design foundation you need to craft a document that will truly catch the attention of a recruiter. If you have the design know-how, you can try to make your own successful design. However, you have big hurdles to cross. Your first challenge is making your most significant accomplishments and experiences stand out enough to convince a hiring manager you’re right for the job after a six-second glance. Templates give you a convenient and fast way to get ready for the arduous job search. Combination formats use a mixture of the chronological and functional techniques. They provide a more even look at a person’s skills and experiences, rather than focusing on one area. Many employers like to see this layout for executive-level employees or anyone changing careers. 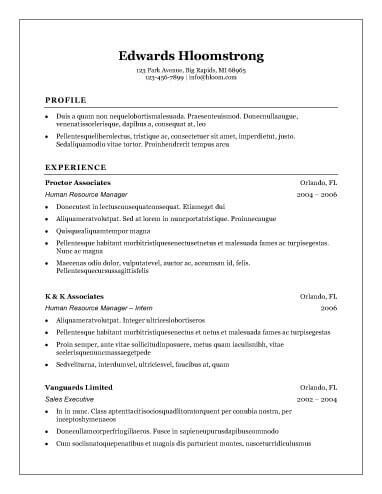 Not all medical resume templates that use this format have the same design features. Medical professionals hoping to work for a startup company or a performing arts group may need to add a little finesse to their professional files. Most medical resume templates will fall into the simple, basic, or traditional categories. However, every once in a while, a document with color, graphics, photos, and embellishments may prove useful for someone in the medical field. Many organizations in the medical industry lean toward the conservative side for employers. This means hiring managers may want to see resumes that focus on skills, experiences, and accomplishments rather than design embellishments, color schemes, and graphics. A basic resume layout still has some eye-catching qualities, like headers, formatting, and bulleted lists. Medical resume templates in this category work well for both newbies and veterans. Medical resume templates can fall into three format categories: chronological, functional, and combination. A chronological layout puts your work history and education in a reverse-chronological order. This type of formatting tends to bring the focus on experiences more than skills. Someone with a lot of medical experience may want to use this format type. Functional medical resume templates, employing what is sometimes referred to as a skills-based layout, prioritize what you’re good at as opposed to what you’ve done. Anyone transitioning into a new career may want to use this layout to showcase their transferable skills. This format also deemphasizes employment gaps, which makes it perfect for a parent returning to work. Now that you understand the importance of how a resume looks, you need to refocus on the importance of the content of this professional document. You can have the best-looking file and still get rejected for not including the right information. Learn how to go about writing a resume by looking through this simple checklist as you fill out our medical resume templates. Make your name stand out. Use a special font to make it easy for the recruiter to know who he or she is reading about. Ensure the hiring manager can get in touch with you. Include an up-to-date phone number, and don’t forget to add a professional-looking email address. Let employers know where you live. They don’t necessarily need to have your entire mailing address, but at least include the city and state you live in. Add a link to a professional website. As a medical professional, you may keep your LinkedIn profile updated, but if not don’t include it. Create an opening statement. Most resumes start with a summary or objective statement. Write a summary statement if you have related experiences, skills, and accomplishments. This paragraph should be a short look at what you can do for the company. Build an objective statement if you’re an entry-level employee or have no related work history. This paragraph should give the employer an idea of what you hope to gain from the job. Form a list of skills you would use to do the job. You can get ideas of what the employer might want by reading through the job posting. Try to include four to six skills. Use a bulleted list to ensure this section remains readable. Avoid pointing out unrelated skills. For example, your cooking abilities likely have nothing to do with your ability to be a medical professional. Point out your most recent work experience. If you’ve been in the workforce for a while, going back 15 to 20 years is sufficient. List the same details for each position. You always want to include the title of the position, the name of the company, and the dates of employment. Let the employer know what you did at your past jobs. Create a list of three to five bullet points covering your responsibilities and accomplishments. Make your fit for the job clear by showcasing your college education. Include the name of your degree, the name of the university, and the date you graduated. Mention any related certifications or trainings. This added education could set you apart from the competition. Once you get your resume started, you may find the process becomes easier. For this reason, you should use any help available to get your document going. 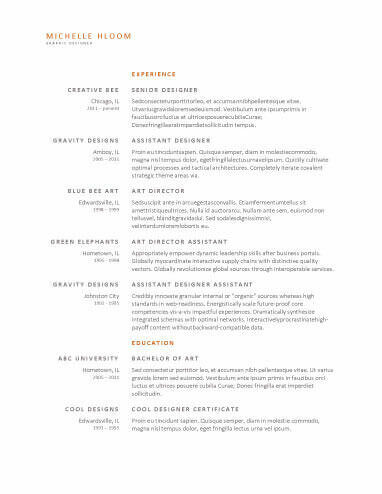 A resume builder can help you make design choices and figure out what professional information to include. You can also gain access to cover letter help, industry-specific advice, and career-oriented keywords thanks to this writing tool. Whether you want to use our medical resume templates or resume builder, you can get a lot of help for the job search right here.